I’ve never met a creative person who isn’t a bit of a pack rat and I’m no exception! For the last couple of weeks, I’ve been reliving my creative past; in other words, I’ve been cleaning out closets. Excavating, evaluating, and marveling at the amount of stuff I have accumulated. I knew I’d been saving things in case I needed them but some of the things I found were long forgotten and sometimes, even now, impossible to part with; like the scrapbook of ideas I made when I was 20. I don’t recall making it but it is so me that it’s surprising; the person I am now and the person I was aren’t that much different. I went so far as to put the book on the throw away pile but I had second thoughts and it’s nestled on the top shelf of the closet destined to be found again sometime in the future. A sweet reminder of my youthful style. Thank you Janice Mercure, you took this picture of me (Pamela Atkinson) and one of my handmade paper reliefs a long time ago and it was one of the things I was happy to find. Over the years, my artwork has gone through changes and the supplies I unearthed reflected my interests and preoccupations. I found the best work I made in college and photo’s of artwork I’ve sold. These things will stay but I’ve been ruthless and only the treasures I’ll be happy to find in the future are packed away. My twenty year old silk screen inks are at the toxic waste disposal. Reflecting on how my style has changed and being able to look back on what was happening in my life when I created the work is a bonus. Finding the elements that tie my diverse body of work together is fun and not surprising. I started out as a painter and became a fiber artist, who became a paper maker, who went back to painting. I want to always be a painter. I feel fulfilled using a brush and pigments. 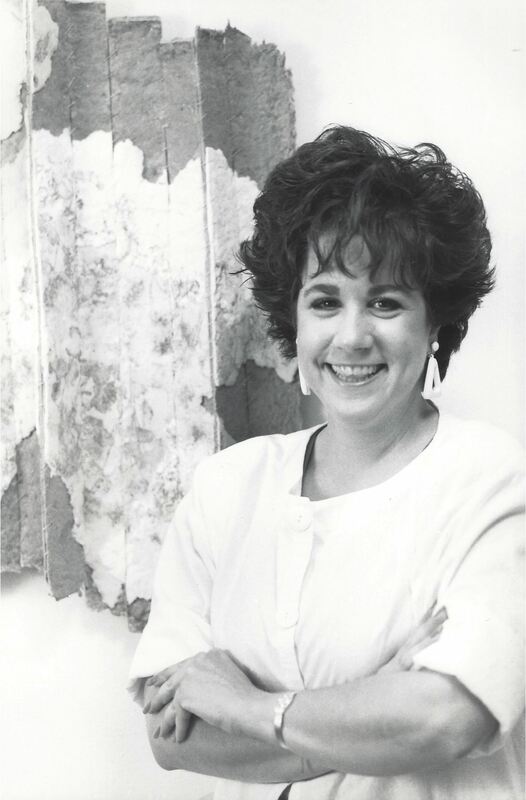 My stint as a fiber artist in college had more to do with a supportive professor and a hospitable creative environment. A good teacher can make a big difference in a artist’s life. The ideas I want to express have changed overtime but the core thoughts are ever-present. A curiosity about the unknown, the spiritual, femininity and strength are as important in my work now as they were in the beginning. Please leave a comment, I’d love to hear if time has changed your artwork or not. This entry was posted in Visual Artist, Painter and tagged brush, creative, femininity, fiber artist, looking back, Painter, Paints, Pam Atkinson, Pamela Atkinson, paper making, pigments, Riverside, spiritual, strength, style, unknown, Visual Artist on August 11, 2014 by Pamela Atkinson.